When Paddington is arrested for a crime he didn't commit, the Brown family must work to prove his innocence while Paddington is forced to survive in a dangerous prison environment. When the original "Paddington" came out in the United States in 2015, we will admit, we weren't really looking forward to it. We thought it would be silly and dumb, judging by the trailer. It completely surprised us and it wound up being one of our favorite films of that year. 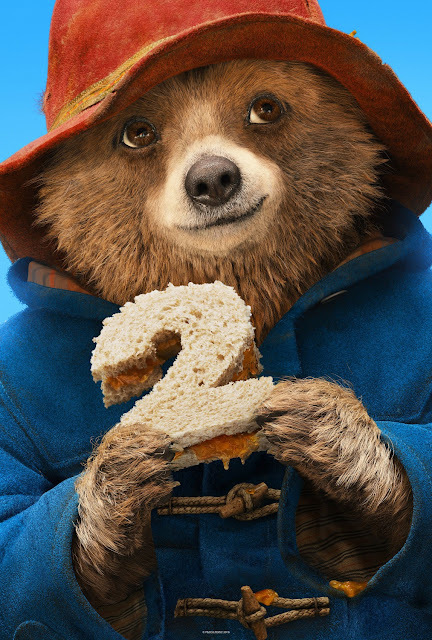 So when a trailer for "Paddington 2" popped up a few months back, we were much more excited to see it, but since we were expecting a good movie, would it live up to its predecessor? "Paddington 2" is directed by Paul King, who helmed the original "Paddington." Also returning is (almost) the entire original cast including Sally Hawkins, Hugh Bonneville, Samuel Josling, and Madeline Harris as the member of the Brown family, Julie Walters as Mrs. Byrd, and of course, Ben Whishaw as the voice of the titular Paddington. New to the cast and replacing Nicole Kidman is Hugh Grant as has-been actor Phoenix Buchanan. Another welcomed addition is Brendan Gleeson as rough and tough prison cook Knuckles McGinty. This sequel sees Paddington looking for the perfect gift to send to his Aunt Lucy for her birthday. He thinks he has found it in an old popup book of London. When Paddington is falsely accused of stealing the book from Mr. Gruber's antique shop, he is sentenced to 10 years in prison for grand larceny. Now, the Brown family must try to prove Paddington's innocence on the outside while Paddington must survive in prison, where his cheery disposition may not be so welcome. Both Paddington as a character and "Paddington 2" as a film are endlessly charming and will bring joy to anyone who encounters with them. You would have to have a sinister, cold as ice soul and a hatred of all happy things to dislike Paddington. In many ways, "Paddington 2" has a lot of the standard family film fare. It has its fair share of slapstick humor, though it rarely if ever resorts to low-brow toilet humor for a cheap laugh. Sure, Paddington rides on the back of a giant dog, drops buckets of water onto his head, and gets carried away by a goose, which kids will love, but it also has loads of witty, smart humor for adults to enjoy as well. Visually, the film is gorgeous to look at. It has a whimsical, vibrant, pleasant aesthetic that will make you awe in its delight. We see shades of Wes Anderson's "The Grand Budapest Hotel," Tim Burton's "Big Fish," as well as other impressive, wonderful techniques from other directors combined beautifully into one cohesive look. Just because a movie looks cool doesn't always mean everything else works out. Luckily, everything else about "Paddington 2" matches its glorious visuals. The acting is incredible. Mrs. Brown is such a gentle character, and there is no better actor to portray a person like this than Sally Hawkins. She maintains the same loving, quirky, head-in-the-clouds personality from the first installment, but now, she seems like an even bigger dreamer who strives for more adventure. Hugh Bonneville cares for Paddington much more in this installment than the last, and it's fun to see him embrace the little brown bear we've come to love into his family. Both Brendan Gleeson and Hugh Grant are fantastic new additions to the series. They each give stellar, amusing, entertaining and fun performances. Paddington himself is such a good-natured, likable bear who never fails to see the good in people, even if they have sinister intentions. Ben Whishaw has the perfect voice to bring this sweet, lovable character to life. We want to feel the way we felt when we watched "Paddington 2" all the time. It's a movie that will make your face hurt from smiling too much. At the same time, it has several moments of touching heart and a couple of instances that will stir up your emotions and may even bring a tear to your eye. This is the perfect film for the whole family. If they don't make another one, we don't think we'll ever be happy again. We highly recommend you go see it. It's the perfect movie we need right now.